Lighthizer: "The NAFTA countries are nowhere near close to a deal...The are gaping differences." WASHINGTON — The United States declared the NAFTA countries were nowhere close to a deal in a statement designed to douse expectations that an agreement might be just a few minor adjustments away. 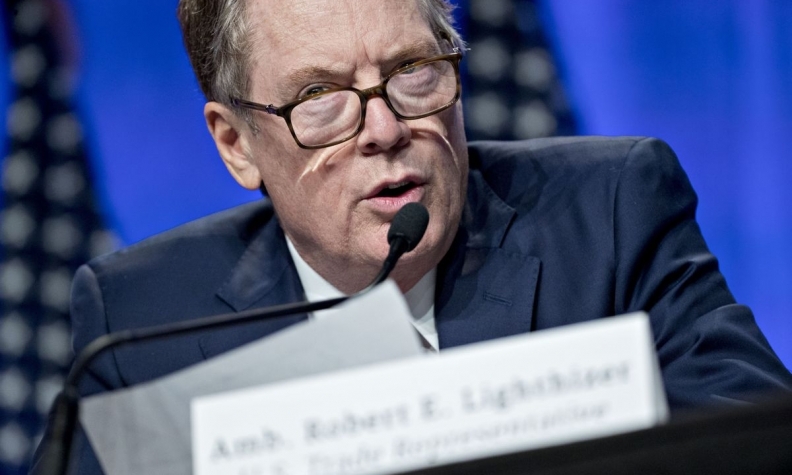 U.S. trade czar Robert Lighthizer rejected the idea that an agreement was within imminent reach. He cited big differences on intellectual property, agriculture, online purchases, energy, labour, rules of origin, and other issues. "The NAFTA countries are nowhere near close to a deal…There are gaping differences," Lighthizer said in an evening statement Thursday. "We of course will continue to engage in negotiations, and I look forward to working with my counterparts to secure the best possible deal for American farmers, ranchers, workers, and businesses." All three countries agreed that they would keep negotiating beyond Thursday, a date that had been presented as a procedural deadline for getting a deal to the U.S. Congress for a vote this year. The reason Canada, Mexico and some in the U.S. want a deal wrapped up has to do with creating certainty — in terms of business confidence, and in order to settle the process before elections in Mexico and the U.S. stall progress until next year. Some fear delay will add political unpredictability, since many of the politicians now involved will no longer be in politics next year: Mexico will have a new administration, the U.S. will have a new Congress after midterm elections, and several senior American lawmakers are retiring. Trudeau had spent the day promoting the idea that an agreement was now within reach. The prime minister received a call from U.S. President Donald Trump on Thursday night in which they discussed the NAFTA negotiations, but a readout provided by Trudeau's office did not include any details. Canada's case lay on a strand of seemingly linear logic. Canada's argument went that if the U.S. claims to be reopening NAFTA specifically to deal with its trade deficit, and if the leading cause of that trade deficit with Mexico involves autos, and if the autos issue is almost solved, then the Americans could walk away right now with a win. "We are close to a deal," the prime minister said in New York. "We are down to a point where there is a good deal on the table." Trudeau admitted to being unsure whether a deal would take days, weeks, or be put off indefinitely. In any case, he said he was ready to keep negotiating: "We'll keep working until they shut off the lights." Trudeau drew another public contradiction Thursday — this one from Mexico. The Mexican government scolded the prime minister over an element of the sales pitch he delivered in New York: Trudeau argued that the autos changes would help the U.S. by bringing back some Mexican jobs. In the midst of a presidential election campaign in that country, and facing its own political pressures at home, the Mexican government publicly challenged Canada's prime minister. "A clarification is necessary," Mexico's economy minister, Ildefonso Guajardo, tweeted. "Any renegotiated NAFTA that implies losses of existing Mexican jobs is unacceptable." Now it appears the U.S. is settling in for harder bargaining on issues like pharmaceuticals, dairy, and online duty-free purchases. Lighthizer's statement did not mention a pair of other sticking points — dispute resolution and a so-called sunset clause. In an appearance on the Fox Business Network, Trudeau had ridiculed the sunset-clause idea, which would see NAFTA automatically end in five years unless all countries agree to extend it. Trudeau used an example designed to appeal to a certain former real-estate developer who is now the U.S. president; he compared the termination clause to building a skyscraper on a parcel of land you might lose in five years. Lighthizer's statement also did not mention the threat of steel and aluminum tariffs — which are, at this point, scheduled to take effect June 1. Those impending tariffs, the July 1 Mexican election, and the U.S. congressional calendar, had all created pressure for an imminent deal. Top U.S. lawmaker Paul Ryan had declared Thursday as the last date for meeting the procedural deadlines for a vote this year. On Thursday, he revised that slightly. Ryan clarified that if the independent body in the U.S. tasked with analysing trade deals managed to assess the new NAFTA faster than legally required, then in theory an agreement could still get to the floor for a vote in this Congress. Some in the Canadian government have mused about the potential strategic benefits of dragging out the talks. However that calculus has been tempered by Bank of Canada analysis that trade uncertainty is hurting the economy, reducing business investment by about two per cent and the overall GDP by about 0.2 per cent this year. That uncertainty has been compounded by the tariff threats.